Liberty ships continue to serve in a "less than whole" function many decades after their launching. In Portland, Oregon, the hulls of Richard Henry Dana and Jane Addams serve as the basis of floating docks. SS Albert M. Boe survives as the Star of Kodiak, a landlocked cannery, in Kodiak Harbor at 57°47′12″N 152°24′18″W﻿ / ﻿57.78667°N 152.40500°W. Convoy HX 300 was the 300th of the numbered series of World War II HX convoys of merchant ships from Halifax to Liverpool. It started its journey on 17 July 1944 and was the largest convoy of the war, comprising 166 ships. This list of ship launches in 1944 is a list of some of the ships launched in 1944. Project Liberty Ship is a non-profit organization in the United States dedicated to the preservation of the Liberty ship SS John W. Brown. 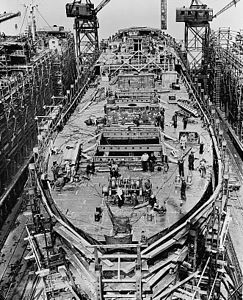 Project Liberty Ship began in 1978, when a seminar on Liberty ship preservation was held aboard the John W. Brown, which was then serving as a nautical high school operated by the City of New York. Those attending the seminar could foresee the day, rapidly approaching, when the last ship of that great fleet of over 2700 Liberty Ships would face the breaker's torch or be sunk as an artificial reef, and they were determined to preserve at least one ship as a memorial museum on the east coast of the United States. With the backing of the National Maritime Historical Society, an organization was formed to work toward the preservation of the John W. Brown. Although there were, at that time, several Liberty Ships that might have been candidates for restoration, the John W. Brown was the logical choice. A small staff of volunteers began planning for the day when New York would close down its floating high school and the ship would become available. A membership drive was commenced and publication of a newsletter, "Liberty Log", was begun. The ship's career as a schoolship ended in 1982, and the group, now called Project Liberty Ship, was in the midst of a search for a suitable berth in New York Harbor at which to display the John W. Brown. Despite their best efforts, Project Liberty Ship could not locate a single berth in the entire harbor that would accept the ship. They were forced to stand and watch as the John W. Brown was towed out of the harbor and down the coast to the James River Reserve Fleet in July 1983. While its membership slowly grew, Project Liberty Ship's volunteer staff continued to search for a berth in New York and accomplished several other important steps. A law was passed in the United States Congress transferring title of the ship from the United States Maritime Administration to Project Liberty Ship. Application was made, and accepted, to list the ship on the National Register of Historic Places. SS John W. Brown became a National Register Ship, one of the very few such ships in the nation. Finally, late in 1987, Project Liberty Ship officers gave up their attempts to berth John W. Brown in New York and turned to Baltimore, Maryland. In January 1988, a meeting was held at the Baltimore Museum of Industry to discuss the idea. They expected half a dozen people to attend and they got 40. From the original group who met at the museum a core committee was formed to begin the effort. "Project Liberty Ship Baltimore" went to work, with the full backing and support of the parent group in New York, to permanently display John W. Brown in the harbor of her birth. SS Albert M. Boe was a Liberty ship laid down on 11 July 1945 at the East Yard of New England Shipbuilding Corporation in Portland, Maine, as a boxed aircraft transport. The ship is notable as the final liberty ship built. She was named after Chief Engineer Albert M. Boe who remained in the engine room acting to control the spread of fire, despite fatal burns, when an engine of the aircraft repair vessel U.S. Army FS-214 exploded. He is credited with saving the lives of other crew members by that action and received the posthumous Merchant Marine Distinguished Service Medal.Albert M. Boe was assigned hull number 3132 by the U.S. Maritime Commission (USMC) and was launched on 26 September 1945 (Engine Builder: Filer & Stowell Company, Milwaukee, Wisconsin); delivered to the US Army and on 30 October 1945 was commissioned USAT Albert M. Boe. On 1 March 1950, she was decommissioned by the US Army and acquired by US Navy as USNS Albert M. Boe (T-AKV-6). On 12 January 1953, she was removed from service, and on 22 January was transferred to the Marine Corps. On 11 March 1954, she was struck from the Naval Register. In 1964, she was sold for commercial service, converted for use as a fish cannery ship, and renamed Star of Kodiak. Though currently landlocked, Star of Kodiak is still in use as the home of Trident Seafoods. SS Alexander Macomb was a Liberty ship of the United States Merchant Marine during World War II. 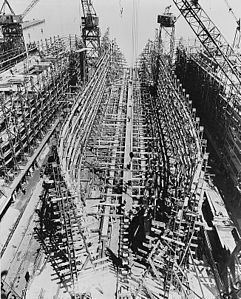 Construction began on Hull 2023 on 18 February 1942 at the Bethlehem-Fairfield Shipyard of the Bethlehem Shipbuilding Corporation in Baltimore, Maryland, under Maritime Commission contract 0036. See, List of Liberty ships: M-R. The ship was launched on 6 May, and her sea trials were completed on 2 June. She was named for Alexander Macomb, an American General known chiefly for his leadership at the Battle of Plattsburgh in the War of 1812. SS James J. Pettigrew (MC contract 874) was a Liberty ship built in the United States during World War II. She was named after J. Johnston Pettigrew, a Confederate general from North Carolina killed during the American Civil War. The ship was laid down by North Carolina Shipbuilding Company in their Cape Fear River yard on November 24, 1942, and launched on December 24, 1942. Pettigrew was chartered to Moore-McCormack Lines by the War Shipping Administration until entering the James River Fleet of the National Defense Reserve Fleet in January of 1946. At the time she required more than $100,000 of repairs. The vessel was sold for scrap in 1967. Now based in San Francisco, she is a rare survivora of the 6,939-ship armada that stormed Normandy on D-Day, 1944.Jeremiah O'Brien, SS John W. Brown, and SS Hellas Liberty are the only currently operational Liberty ships of the 2,710 built. SS John Burke (MC hull number 609) was an American Liberty Ship built during World War II, one of the 2,710 type 'EC2-S-C1' ships that carried all kinds and types of dry cargo during the war. The ship was named for John Burke (February 25, 1859 – May 14, 1937), the 10th Governor of North Dakota. Burke was built at Kaiser Shipbuilding Company's Oregon Shipbuilding yard in Portland, Oregon. 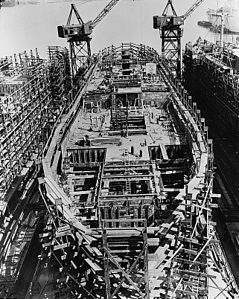 Burke's keel was laid November 20, 1942 and the hull was launched on December 13. After fitting-out, Burke was delivered to the US Maritime Commission on December 23, just 33 days after construction began. The War Shipping Administration then placed Burke under management of the Northland Transportation Company.On December 28, 1944, while transporting ammunition to Mindoro, Philippines, Burke was hit by a Japanese kamikaze aircraft, and disintegrated in a tremendous explosion with the loss of all hands. John Burke was one of three Liberty Ships and one of forty-seven ships sunk by kamikaze attack during World War II. SS John W. Brown is a Liberty ship, one of two still operational and one of three preserved as museum ships. As a Liberty ship, she operated as a merchant ship of the United States Merchant Marine during World War II and later was a vocational high school training ship in New York City for many years. Now preserved, she is a museum ship and cruise ship berthed at Clinton Street Pier 1 in Baltimore Harbor in Maryland. John W. Brown was named after the Canadian-born American labor union leader John W. Brown (1867–1941).The other surviving operational Liberty ship is SS Jeremiah O'Brien in San Francisco, California. A third Liberty ship, SS Hellas Liberty (ex-SS Arthur M. Huddell) is preserved as a static museum ship in Piraeus, Greece. SS John Wright Stanly (MC contract 881) was a Liberty ship built in the United States during World War II. She was originally named after John Wright Stanly, a New Bern, North Carolina businessman and American Revolutionary War privateer. On the ways she was renamed SS Leiv Eiriksson after the Norse explorer. 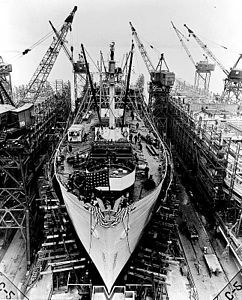 The ship was laid down by North Carolina Shipbuilding Company in their Cape Fear River yard on December 18, 1942, then launched on January 19, 1943. She was operated by the Barber Steamship Company from her deliver until August 14, 1944 when American West African Lines took over. In October 1946 the Norwegian government purchased Eriksson. She was sold into private hands in 1947 and scrapped in 1969. SS Joseph Hewes (MC contract 217) was a Liberty ship built in the United States during World War II. She was named after Joseph Hewes, Secretary of the Naval Affairs in the 2nd Continental Congress and signer of the Declaration of Independence for North Carolina. 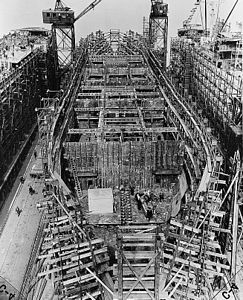 The ship was laid down by North Carolina Shipbuilding Company in their Cape Fear River yard on September 22, 1941, and launched on March 29, 1942. She was chartered to A.H. Bull and Company upon completion in 1942 by the War Shipping Administration. This was renewed in May of 1947. In August of that year it was chartered to the States Marine Corporation. It was briefly operated in October of 1948 by the South Atlantic Steamship Company before being layed up in the National Defense Reserve Fleet at Beaumont, Texas. It was sold for scrap in 1967.